With grain salads, that is. These are a carb-lover/salad-obsessed person’s dream. We can feel healthy and immensely satisfied at the same time (did someone say balance?) It’s the best of both worlds! I’d been seeing grain salads popping up here and there on menus, magazines and the World Wide Web for a few months, but it wasn’t until we were in Napa on our last wedding planning trip that I became wholly and completely enamored. We had been out wedding planning all morning, and were desperate for a light snack when we got back to St. Helena where we were staying. We (easily) decided to stop into one of our favorite casual tasting rooms on the “main drag”, Velo Vino, to have a glass of wine and a light bite to eat from their almost world-famous Bruschetteria Food Truck. We of course had to order some bruschetta (Funghi FTW!) but I wanted to balance it out with something a little lighter and nutrient-dense. My eyes gravitated toward the Fagioli e Grano salad and we were sold. I’m happy to report that we were the furthest you could be from disappointed. 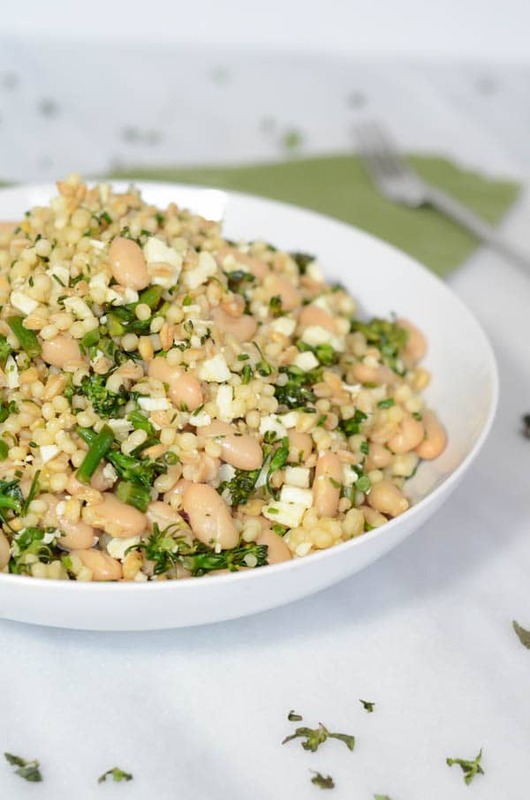 The salad was perfectly balanced, with a little saltiness from ricotta salata, a little acid from some fresh lemon juice, and great substance from not one, but TWO types of grains, broccoli rabe and white beans. Yes, the flavors were on point and I am soooo all about that. I immediately added it to the list of things I needed to try to recreate at home. And recreate it I did! 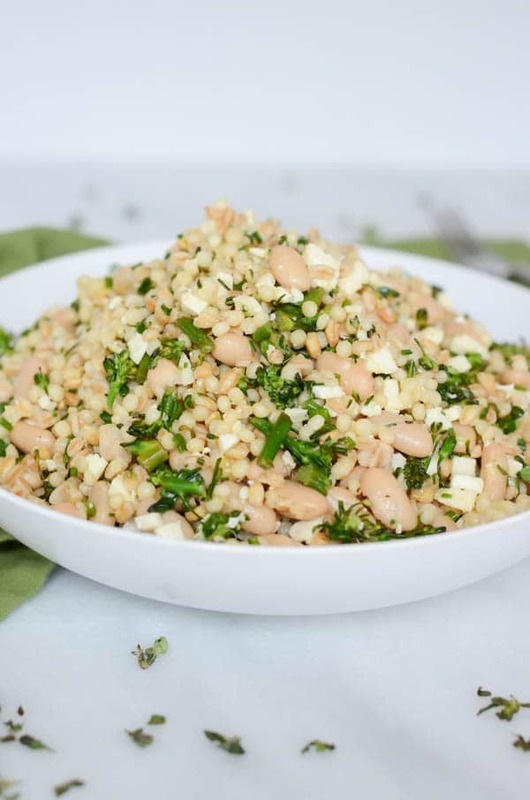 But before I get into the nitty-gritty, let’s just talk about how perfect this Herbed Grain Salad with Broccoli Rabe and White Beans will be for your Memorial Day beach partying and BBQing. It isn’t extremely sensitive to warm temperatures (outdoor event friendly!) and it won’t wilt down to absolutely nothing like all of our favorite green salads tend to do when either dressed or set outside for long periods of time. Plus, it’s travel-friendly! It holds up well yet it’s extremely refreshing and won’t weigh you down for floating around in the ocean (or the pool!) and soaking up some sun. It’s the exact opposite of my Reuben Dip, hence all the more reason why you should make both dishes this holiday weekend and be selective of which one you share and which one you hoard to yourself. I’ll let you be the judge of that. Okay, so this recipe is super easy. 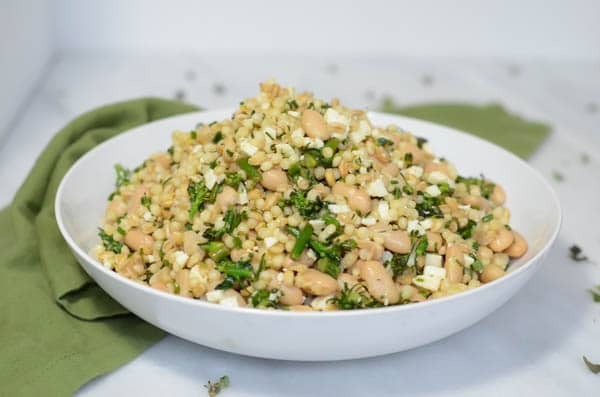 We simply cook up some Israeli couscous and some farro, and then mix them all up with such delicious fixin’s as broccoli rabe, fresh chives, queso fresco and cannellini beans. We finish off this flavor-bomb of a salad with olive oil and fresh lemon juice, and then we just let all of the flavors do their little dance on our tastebuds. Soooo good. I’m salivating just thinking about it. The great thing is, if any of these ingredients aren’t quite your jam, the recipe is completely customizeable. Feel free to include any number of fresh herbs and vegetables, your choice of cheese, fresh herbs…The possibilities are endless! 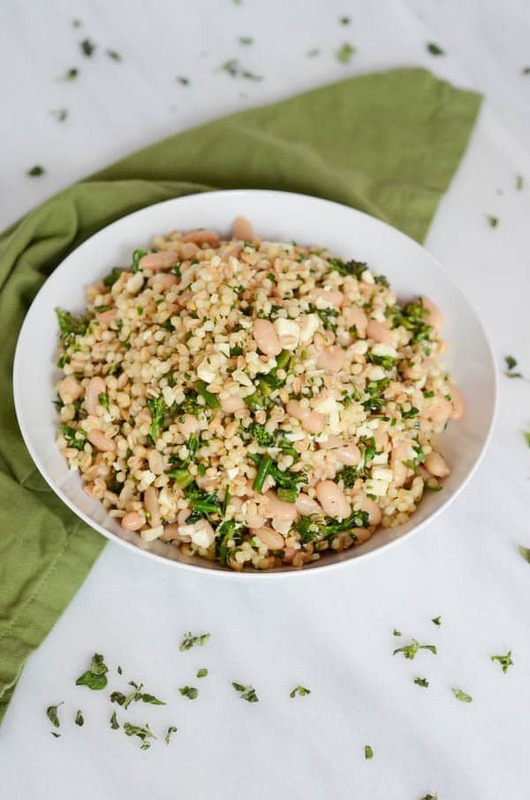 A refreshing yet filling salad with two types of whole grains, fresh vegetables and herbs. First, make the couscous. In a 1 ½ quart saucepan, bring the couscous and chicken broth to a boil. Once boiling, turn down heat to a simmer, cover, and cook for 10-15 minutes, or until broth has been absorbed and couscous is soft. Remove from heat and set aside. Next, make the farro. Following the same process as above, place ½ cup farro and 1 cup chicken broth into a 1 ½ quart saucepan over high heat. Bring to a boil. Turn down heat and let simmer for about 10 minutes, or until broth is absorbed and farro is soft. Remove from heat and set aside. 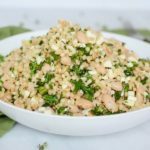 Combine couscous and farro in a large mixing bowl. To cook the broccoli rabe, heat 2 tablespoons olive oil in a sauté pan over medium-high heat. Once heated, add minced garlic and sauté for 1-2 minutes, just until garlic becomes fragrant. Add broccoli rabe to pan and sauté until rabe is cooked. Combine cousous, farro and broccoli rabe in the large mixing bowl. Add all other ingredients (queso fresco through olive oil) and toss to combine. Refrigerate until ready to serve.